The first episode of Telltale’s new Batman series challenges players to see how far they’ll push the Dark Knight. The quality of this new series will be determined by how Telltale themselves can push Batman. The series’ two-hour debut, out today for PC, PS4 and Xbox One and following on more platforms “soon,” focuses on several rising threats to Gotham City and its super-hero protector. The mayoral race is getting ugly. Crime boss Carmine Falcone is picking fights. Oswald Cobblepot, a skinny man who is not (yet?) the Penguin, appears to be scheming. Catwoman debuts and tangles with Batman. The biggest threat in the series, however, could be the status quo. Those who come to Telltale games for interactive stories that involve interesting dilemmas will find a few tough decisions in this first chapter but will have no way of judging if Telltale is going to be able to deliver consequences half as shocking as those in their milestone take on The Walking Dead. Surprises are not a requirement for video game storytelling, but Telltale has a penchant for twists and for making early choices pay off big later. They’re also telling a story that isn’t connected to established Bat-continuity, so playing it safe would be a shame. As billionaire Bruce, you chat up politicians, partygoers and people who might know what Bruce Wayne does at night. In this first episode, Realm of Shadows, players mostly play as Bruce Wayne, which is at least a twist from how video games usually depict a Batman adventure. As billionaire Bruce, you chat up politicians, partygoers and people who might know what Bruce Wayne does at night. You’ll decide whether to shake Falcone’s hand at an important public event and choose whether to give a key piece of evidence to the police or the media. As Batman, players will decide whether to torture a criminal for information or brutalize another in front of a news camera. The role-playing moral spectrum for the Batman parts of the game is not quite Adam West to Christian Bale, but Telltale is at least testing the darker limits of what Batman might do. The true shock would be if they would let players make Batman a villain, a failure or something genuinely meant to be morally horrifying. That is not generally Batman’s default mode, but in giving players some leeway in the first episode, they are at least teasing some extreme possibilities for the character. 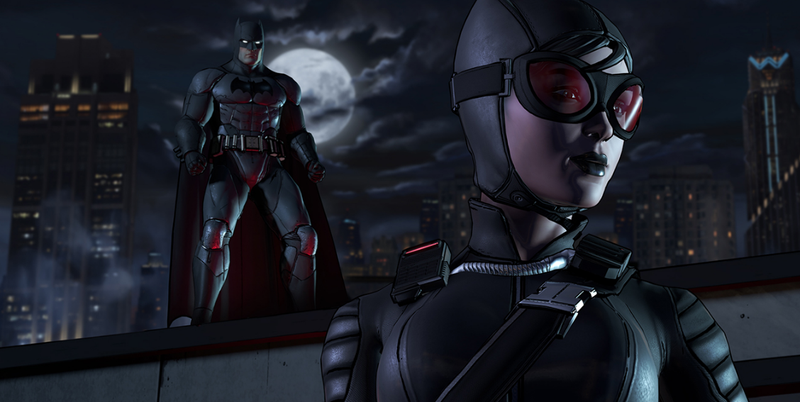 Telltale has said that their series can be viewed as a remix of Batman lore. It’s not clear if, say, district attorney and Bruce Wayne buddy Harvey Dent will turn into the villainous Two-Face. This series’ version of Jim Gordon still seems like a good cop, but it remains possible, at least, that others could be presented against type. By the first episode’s end, Telltale is teasing that a couple of characters who, in Batman lore, have almost always been presented as good guys, might be crooked. “How far will you go?” the game keeps asking players. “How far are you guys going?” the player might as well respond. Giving it the benefit of the doubt, Telltale’s first Batman episode is a good start. It is heavy with dialogue and more of a Bruce Wayne adventure than a Batman one. There are Batman bits, mostly it seems as a way to present some action. In these fight scenes, Telltale tests the player’s reflexes to make the correct inputs so Batman can more effectively beat up his enemies. Action scenes mostly proceed toward success regardless of player input, but they go better if the player helps them along. There are some moments for possible failure. Let Catwoman drop to her death at one point, for example, and it is game over. “How far will you go?” the game keeps asking players. “How far are you guys going?” the player might as well respond. Late in the episode, Telltale lets Batman do some clue-finding detective work. Even later, the studio lets players use Batman’s drone to plan his raid on a villain’s hangout. Maybe the player will first choose to attack from the balcony, then throw a piece of modern art at another enemy, rush another guard in the back and so on. You select thugs, link them with spots from which Batman will attack from and then trigger the sequence to begin. Telltale’s game presents a refreshingly different take on Batman gaming. Playing as Bruce Wayne feels novel, though there is ample risk of simply playing at the same themes of a billionaire pushing himself to his physical, mental and moral limit that have been exhaustively covered in Batman comics and movies. There is a chance with Telltale’s Batman to at least do something new for the character in a video game, if not something new for the character overall. Is this a story that lets players guide Batman down the darkest of paths? A story that inverts the morality of key franchise characters? Or are these moves all feints performed within the limits of the Batman license? It’s impossible to discern from the game’s enjoyable opening chapter. The debut episode is either laying groundwork for a shocking story or is presenting another Batman work that teases at twists only to settle on convention. We’ll find out over the coming months. Telltale plans to release at least three more episodes of this five-parter to be released this year, with the finale probable for early 2017.